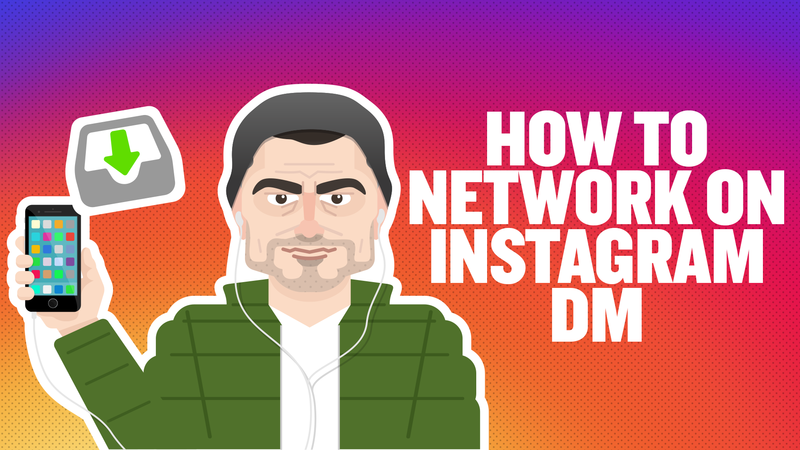 Instagram DM (Direct Message) is the single biggest networking or business development opportunity of this decade. Eventually users will have greater privacy permissions, allowing them to block direct messages from occurring on the platform. As of right now, this does not exist, with Instagram allowing you to DM any user on the service. Here’s my step by step guide to deriving the most value from this unprecedented opportunity. Do this, and you will win! In a world full of salespeople, there are so many individuals just trying to market, sell, or take advantage of you and not enough people thinking “How can I actually solve your problem?” or “How can I actually bring you value?” The key is to connect first, provide value, and THEN given the right opportunity presents itself, ASK. This is the essence of my book “Jab, Jab, Jab, Right Hook” because remember: business lasts a lifetime not a day. In the world of social, there is a lot of noise. First you need to locate your point of interest by doing a quick search through Instagram. The beauty is that you can find a near infinite amount of leads through a number of unique ways. You can choose to search by location, hashtag or user. As a reference to an example I will develop later, let’s say you cut hair. So you’re a hairdresser on the Upper East Side of New York. 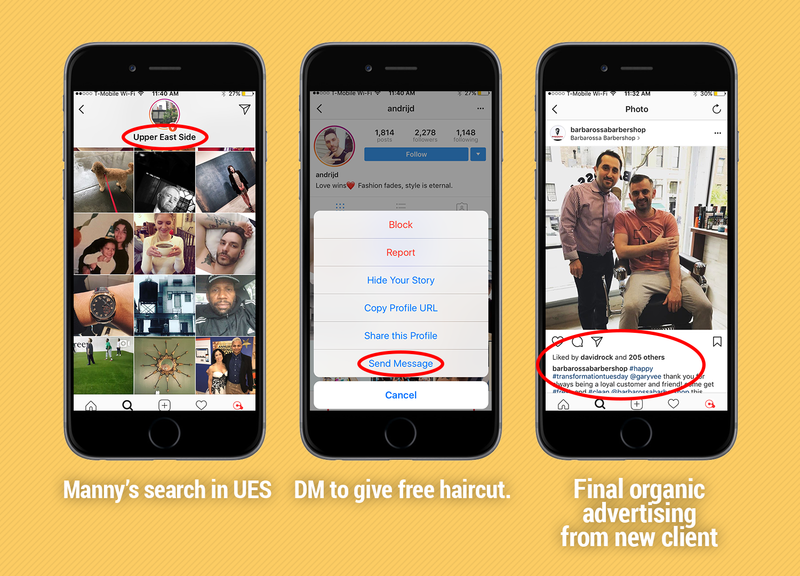 You can easily begin your Instagram strategy by searching the hashtag “haircut” or filtering by location using the address of your store. Look at the top and most recent posts and start examining each account. Too many people get caught up thinking they have to identify people with 100,000 plus followers. Unless you’re a big time business with a big budget, you don’t need this approach. If you can activate “micro-influencers,” or people with smaller followings but tremendous engagement that live nearby, you can win. Spend about 30 seconds scrolling through their account(s) and understanding their likes, dislikes and activity. Even if the account only has 190 followers but every single post that user creates has 60 likes and 20 comments, REACH OUT via Instagram DM. If the relationship between their following and their engagement is strong, that means that they have their audience’s ATTENTION, which is so crucial in today’s digital world. So pay attention to micro-influencers that are within the region you’re targeting. They can provide tremendous value to you and your business and all it takes is a single direct message to start building a relationship. My one reservation with this article is that it’s just gonna turn a lot of you into spam bots. That you’re just gonna control copy, go into DM and start pasting and getting banned or paused by Instagram, because you’re literally just spamming random accounts. The entirety of this post is to get you to understand how you can bring them value. Right now, your entire energy is predicated on what can I get out of this? Of course you can DM The Rock, DM Warren Buffett, DM Tyra Banks, DM some founder that you love, but if you don’t consider what that person actually needs or wants you will never get through. This is the number one arbitrage for success. If you are not providing value, they will not respond. Remember: your value proposition is how you can help solve the problem they are currently experiencing or haven’t thought of yet. This one is easy but a lot of you still don’t understand. Success is a numbers game. Be prepared to get 100 no’s for every yes. Most people won’t even reply. But don’t get discouraged and don’t be romantic. It’s part of the game. Many people at the top have similar skills. A LOT of companies and individuals and influencers can bring you A LOT of value, and opportunity. Needless to say, most individuals are fairly well connected, and many might be friends or employees of the person you are trying to reach. Once you get the opportunity, you need to deliver. Don’t be upset if you DM 900 people and 2 say yes and you fail to deliver. Ultimately skill and execution are everything. Direct Messages just help you get your foot in the door. And my answer is that an opportunity like this comes around once in a decade, where a new platform arises, and you have unprecedented access to individuals you never had before. This happened in the early days of email marketing in 1995/1996 and again in 2003/2004 with the first set of internet blogs. I remember the day when CEO’s were sending out email newsletters and marketing themselves! All the while leaving their phone number as the contact for support. The same thing happened in 2003/2004 when blogging became a thing. The first adopters (those in “the know”) and usually working at the top were well positioned as early adopters looking to try the latest thing. People who had multi-million dollar salaries in business and media would open themselves up to the internet with the ability to comment, contact and connect. Some individuals literally have 100+ million followers on the platform. But here is one way I promise you that you will not build your Instagram profile: By not doing anything. By sitting and having a beer with your friend and complaining that it’s so hard to build your account. Search hashtags, click them, look at the account, see how you can bring them value, DM them, go in soft, bring more value, rinse and repeat. Two, three, four, five thousand times. I truly want you to search every hashtag. I want you to search grocery store, local butcher, plumber, marketing, design, coffee, everything! When you search for it on Instagram there is going to be a hashtag. I want you to spend 25 minutes researching every picture in your specific niche that has the hashtag plumber, or gardener, or coffee and see if it’s the account of a plumbing company, or a flower delivery business or a coffee shop. Look at the top posts and learn about these accounts. This is all education and regardless of the outcome you will at least be informed by new knowledge of your industry and who is winning in the social media space. Trust me, you are going to find a custom design firm in Toronto. Or a coffee shop in New York, or a plumber in rural Idaho. They will have 148,000 followers. Or 600. Or 6000. Look at what they post. And if you’re in school, or you hate your job, or you want to connect, I want you to do this for three to five to seven hours every single day. Which means that you’ll message between 70 and 250 people a day and you will do a lot of business. Knowing me, business development, is one of the pillars of my success. The reason I’m good at business development is I try to bring more value to the other person first. I think about it as the bare mechanics of all business. If you have down time, why not business develop? The fact that you can business develop on your iPhone and on Instagram, and Twitter and Snapchat and Facebook is insane. And if you offer something in return, three out of 37 people will take you up on it. The first 200 might say no, or nothing at all, but the next person might say “yes” and then you business develop and things start happening. Here is another real world example for you to think through. Let’s talk about the fitness hashtag. You know only 190,000,000 engagements in the top posts and most recent. So now you search the hashtag, you go to a top post, you find an account, you click it. He’s got 88,000 Followers. But DM is just the entry point. You have to make sure your Instagram account and your execution is on point. You can’t just DM Chance and have no prior experience and say I want to make videos for you. You have to show that you can execute and provide value. Start by making awesome Instagram videos for your friends, or your uncle, or your dog. Do something to show that you can execute and make great work! It doesn’t cost a lot of money. If you have a smart phone and access to the internet you can not complain! I go to a barber on the Upper East Side. His name is Manny and he has never used Instagram in his life (until I showed him how ;) and now he’s crushing it. His entire business is built on word of mouth. So here is another example of what Manny should do. For Manny, he can search the Upper East Side, and see everybody who’s posting in the area. You can literally see that someone recently posted from a nearby restaurant, click on their account, and message them saying, “I like your Instagram account. If you would like a free haircut, I’d love to have you come by.” What’s great about this is that these are all individuals who already like to share their lives. So if they come, it’s likely they’ll give you a shout out. This is word of mouth on steroids. I just don’t see people doing it and it is absolutely going down on Instagram DM. Even better. I want this to be heavy example time. If you’re an influencer, DM can be a tremendous asset to engage with your fans. Just sending a simple message like “Thank you ❤” can mean the world. You should check the Giants hashtag and literally just DM that person. Just say “Awesome.” And they’ll be like, “Holy crap.” It will open up so many doors and provide the human element of being an influencer that so many of you lack. All of the sudden, when you do that and engage with them as the Giant’s punter whether they know you or not, you will win. Before you know it, that same fan could be setting you up with a business meeting or their brother happens to be the VP of sales at Reebok and wants to a do a shoe placement or a sneaker deal. To me, vlogs are the answer. DM’ing Drock on Instagram to get your song on DailyVee is the answer. Every single rapper, every single artist should literally DM and message every single vlogger that has 100,000 views per video and give them free music to put in their vlogs. This is literally how simple it is. If you are good enough you will win. People have no idea how much influence they can get from having their music in one random blog. Having an influencer listen to or promote your work is the ultimate word of mouth and three years from now, some random person discovers that episode and happens to be an exec at a huge record label like Sony and your life is literally forever made! It’s all just work. Three of those 79 people say, “Yo, send me a song, a shirt, a quote, a photo.” One of those three that you send a shirt puts it in their store, one popular model with a million+ followers walks in, wears it, takes one picture and away you go.